1. After creating an account at ARCbots.com and confirming your email address, login to the Cpanel and you will be immediately re directed to the main Dashboard that you will be accessing to start, stop, and edit your bot. Enter your Chat room name and chat password and click change room. 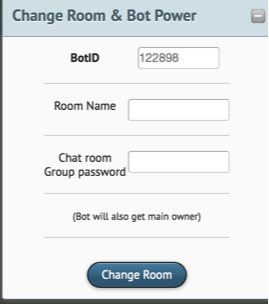 This will update your chat rooms (bot) power for you. Once the green confirmation appears, go to step 2. Enter your xat ID and click change owner. When the green confirmation appears, go to step 3. 3. Next, you need to assign the BOT power to your chat. Go to your chat, type (bot) hit enter, and then click on the power and hit assign. Afterwards, still in your chat, go to Edit Your Chat > Extra Features, and scroll down to the bot power and make sure its selected. Click edit and a new window will open with a textfield. Enter 1510151 in the textfield and click OK.
4. Your arcbot comes with a 5 day free trial. To activate your time, you have to move it from your account to the bot. If a number other than 0 is displaying, you can click add time to add all your time at once, or change the number to add a specific number of hours. Clicking add time will automatically start your bot. 5 Thats it! You're ready to start your bot! Click the green restart button on the main page of your bot to start enjoying your ARCbot! If your bot is already online from step 4, don't worry about restarting it again.